Today, we’re going to examine a few different types of shaving soap out there, and take a look at the differences between the ingredients and processes used. 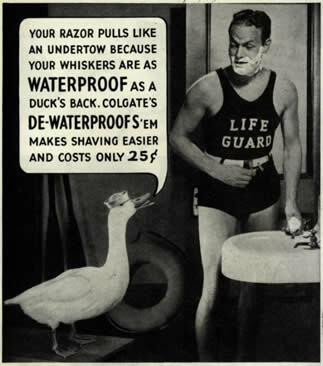 The standard shaving soap of today hasn’t changed a whole lot since before World War I. Well, it’s not sold by talking ducks on behalf of a toothpaste company, but you can’t have it all. Italian-style or French-style shaving soap, or simply soft soap, is (surprisingly) softer than the run-of-the-mill hard soap. These soaps have a putty-like consistency, typically due to a different alkali ratio. Other than being a little easier to load on to your shaving brush or transfer to another bowl, there’s not many important differences here. Shaving cream has not had its ship entirely sunk by those mediocre mass produced products. Rejoice, fellow cream men! Shaving cream lives on in its more traditional form, which still requires lathering up with a brush. It lasts for an incredibly long time, produces a beautifully rich lather, and provides a wonderful shave, just like shaving soap. The lather can deflate a little faster than that of a shaving soap, though. Still, cream is just as good as soap. As for making it, cream soaps are notoriously fickle. We’ll focus on hard soaps first, but a cursory look at shaving cream recipes in the future isn’t impossible. We’ll need to know all the same information, and the chances of an unusable failure is lessened with regular soap. Just… just don’t. These products usually contain substances you’d never need or want to put in your soap, like isobutane, isopentane, triethanolamine (TEA), and so on. Even if you’re not the type to take a second look at ingredient lists or fret about what may or may not be toxic or dangerous, there’s really no need to use this disappointing goop. It just doesn’t work very well most of the time, and if there is one that does, I’ve never heard a convincing reason to use it over soap or cream. Keep in mind that these aren’t hard and fast categories – there are softer ‘hard soaps’ and harder ‘soft soaps’. There isn’t really a strict, objective way to decide where a soap that lands in the middle should belong. That being said, there are similar ingredients and techniques used in shaving soaps (such as triple milling) that can reliably influence hardness. Thanks for reading! I’m having a great time writing and researching these posts, watching the blog begin to accumulate followers, and interacting with new people. Even though we’re only covering basics so far, I’m already learning a lot, and I hope you are too! Which is your favorite – hard soap, soft soap, or shaving cream? We make shave soap using a blend of coconut, palm and olive oil, with an aloe butter to stabilize the whipped shave foam. And we use bentonite clay for that easy glide slip on the skin. Bentonite clay also has a unique quality – as it comes in contact with water an electric charge occurs, allowing the hair to stand on end for closer shave. The clay also detoxes pores leaving skin soft, clean, and the closes shave. Sounds great, Barbara! I had no idea about the electrical charge produced by bentonite clay – very interesting. A dedicated clay post is definitely on my to-do list here, as it’s widely used among soapers, but many wet shavers worry that it dulls the blade faster. I’m looking forward to figuring out how true that is, because I’ve experienced all the benefits of clay you mentioned first-hand. I have played with home brewing a few batches of soap so far. I have used combinations of coconut, palm, tallow, castor, and lanolin and gotten some nice results. One of the factors I am trying to figure out is the ratio of KOH to NaOH. This directly affects the softness of the soap. I haven’t achieved a true cream yet but I have to work through a lot of soap before I experiment again. Awesome, Matt! All highly regarded ingredients – you’ve clearly done your research! I’m definitely planning a post on the KOH/NaOH ratio soon. But, as far as true cream soaps go (rather than just soft soaps), it seems like there are additional factors that determine if it comes out well or not. I haven’t messed with them too much yet. It’s a great demonstration of the effect of different ratios. He also shows different proportions of stearic acid. Do you make shave soap? Or just a major fan? Just a fan, for now – my aim with this blog is to share my research process, help out other people looking for information on making shave soap, and thereby hold myself accountable for making sure my research is thorough. But the ultimate point of doing this research is to begin making soap. My hope is that this blog will serve as a way for myself and others to cut down on the trial and error approach in the beginning and get us to a decent soap quicker & cheaper. I enjoy the research aspect almost as much as any other part. Excellent video BTW. There must be certainly also good shaving gels out there right? I mean I wouldn’t advise them either, but also not say not to use them. Personally I prefer shaving creams over shaving soaps, they offer some benefits that a average shaving soap doesn’t and one of the biggest benefits is that they are often easier to lather up. I’d have to agree that there could be good gels out there somewhere, but I’ve never seen any that offer benefits beyond a traditional soap or cream. Many of the canned products I have seen use propellants, alcohol, and even numbing agents, none of which are necessary in soap. For many artisans, there would be no point figuring out how to make a good gel when you can already make a great soap. « Anatomy of a Shaving Soap: What Makes a Shaving Soap Recipe Good?